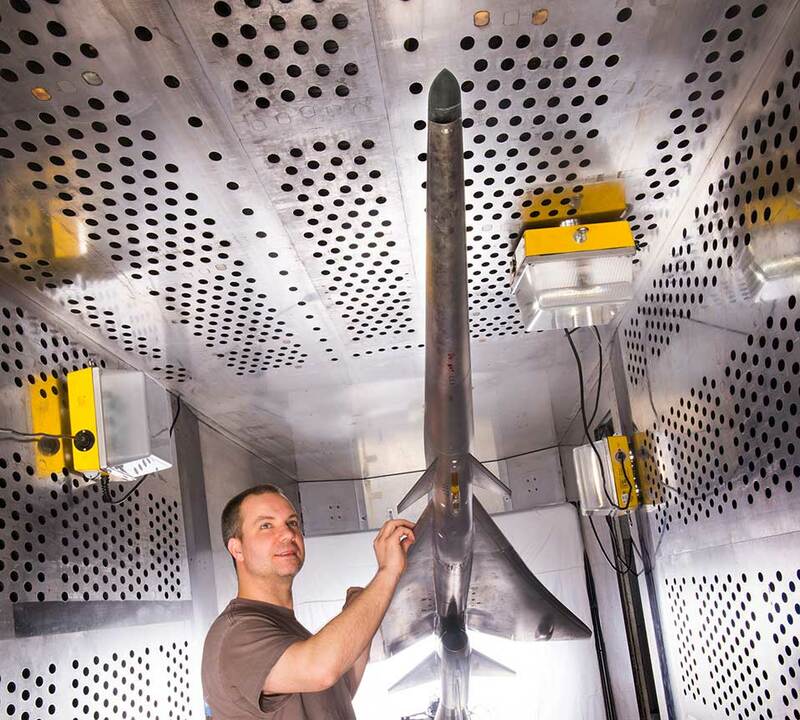 Mechanical technician Dan Pitts prepares a nine percent scale model of Lockheed Martin’s Quiet Supersonic Technology (QueSST) X-plane preliminary design for its first high-speed wind tunnel tests at NASA's Glenn Research Center in Cleveland. NASA and Lockheed Martin have commenced the first high-speed wind tunnel tests for the Quiet Supersonic Technology (QueSST) X-plane preliminary design at NASA’s Glenn Research Centre in Cleveland. 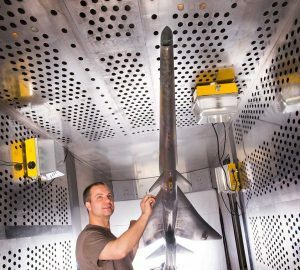 Mechanical technician Dan Pitts prepares a nine percent scale model of Lockheed Martin’s Quiet Supersonic Technology (QueSST) X-plane preliminary design for its first high-speed wind tunnel tests at NASA’s Glenn Research Center in Cleveland. NASA said the program will run for eight weeks during which scientists will expose a nine percent scale model of Lockheed Martin’s X-plane design to wind speeds ranging from Mach 0.3 to Mach 1.6 to understand the aerodynamics of the design as well as aspects of the propulsion system. Aerospace engineer Ray Castner, who leads propulsion testing for NASA’s QueSST effort, said the QueSST X-plane was expected to pave the way for supersonic flight over land in the not too distant future. “We’ll be measuring the lift, drag and side forces on the model at different angles to verify that it performs as expected,” Mr Castner added. Facility manager David Stark said Glenn’s 8’ x 6’ Supersonic Wind Tunnel was uniquely suited for the test because of its size and ability to create a wide range of wind speeds. “We need to see how the design performs from just after takeoff, up to cruising at supersonic speed, back to the start of the landing approach,” Mr Stark said. Peter Iosifidis, QueSST program manager at Lockheed Martin Skunk Works, said recent research had shown it was possible for a supersonic airplane to be shaped in such a way that the shock waves it forms when flying faster than the speed of sound can generate a sound at ground that would be hardly noticeable, at the very least. “Our unique aircraft design is shaped to separate the shocks and expansions associated with supersonic flight, dramatically reducing the aircraft’s loudness,” Mr Iosifidis noted. Lockheed Martin engineers developed the preliminary design for the new “low boom” flight demonstration aircraft featuring Quiet Supersonic Technology under a $20 million contract awarded by NASA in February 2016. According to NASA, this design phase has matured the details of the aircraft shape, performance and flight systems, with wind tunnel testing and analysis expected to continue until mid-2017. Assuming funding is approved, NASA expects to compete and award another contract for the final design, fabrication, and testing of the low-boom flight demonstration aircraft.